Church flyers are basically the design templates or layouts that contains information about the upcoming events in your church. If you wish to spread the word about any event or occasion that is happening in or with regards to your church, then you can make use of church flyers. 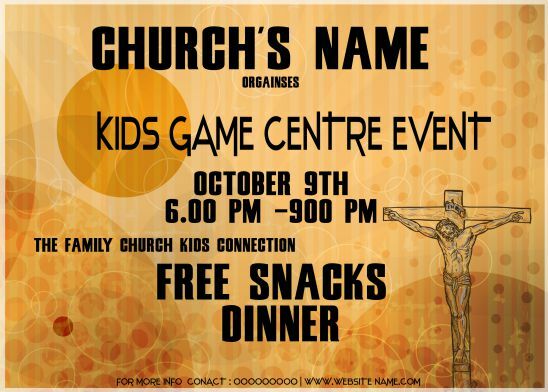 In simple words, it is a form of paper advertisement for your church events. 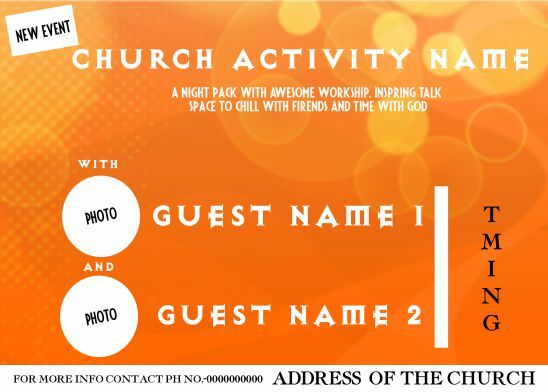 If you are a member or worker of a church, would you like to inform the church goes or the people around about the various activities or events or occasions or workshops happening in the church, then church flyers are the best option to spread the news. Do you think where to avail it or where can you get it from? No Worries!! 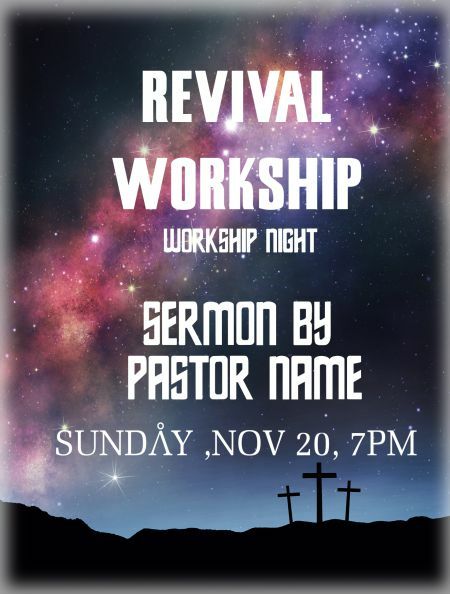 We are here to help you out with all kinds of church flyer templates which have been designed professionally by our team which are in the ready to use format. Church opening, Re-location, Celebration, workshops, events, whatever it is you can avail any kind of church flyer templates from our page. All you have to do is to just download these template and customize it as per your need by providing the required details and use. Guess what!! You don’t have to spend even a single penny for this as these are free to download. If you are organizing any meeting and inviting people to directly participate as the speaker for that particular meeting. 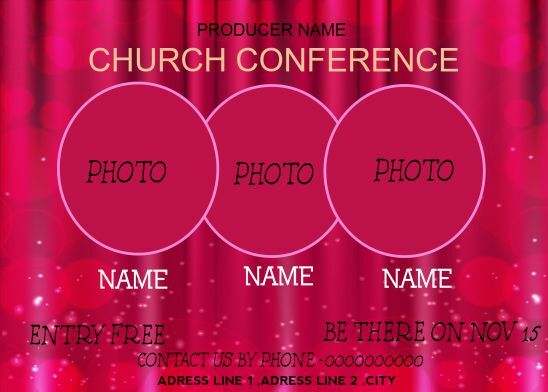 For example, to speak about hope of Christ or any other topic then these templates will be apt for you to use just by modifying the church name, wording for the speakers, topic to talk about, being an open ground you may also add the registration fee is required and the other common details of contact information and address. You can download these free printable church flyer template and use it for celebrating the church anniversaries. 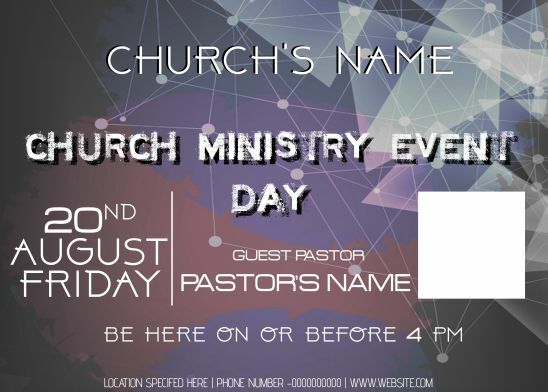 These are free editable flyers where you can mention the church name, a pastor who is going to provide speak in the function, chief guest name if any, and the contact details. A word of acknowledgement and appreciation means a lot to anybody in this fast-moving world. 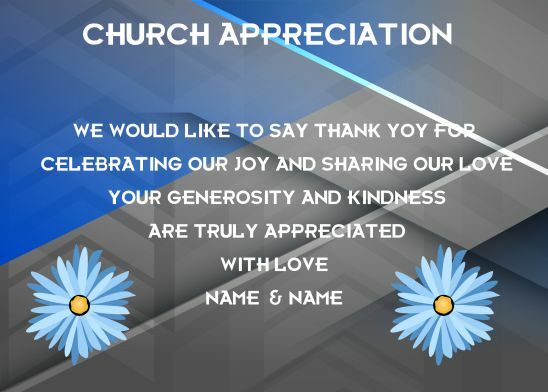 Would you like to show your gratitude or appreciate the individuals for attending any event conducted in/by the church? Then there is the template for that, all you have to do is to add the quote you wish along with the name and you are ready to share a thank you note. 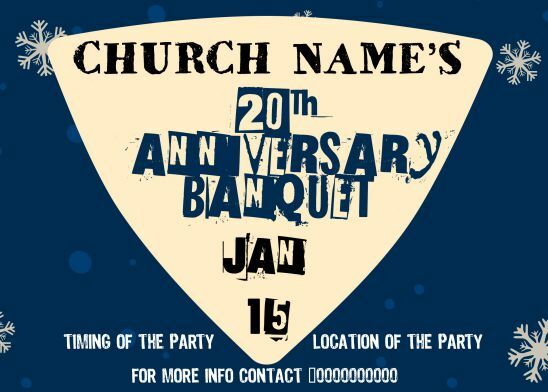 This most stylish template can be used for any party celebration at the church. 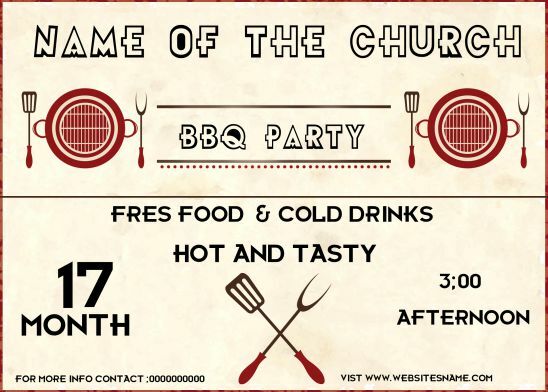 You can make it more decorative and with the party name, meal provided, details of the meal if required, time and date when is it going to happen and most importantly the church name and address and contact details. Are you intended to serve a good and freshly cooked meal for the churchgoers and other? 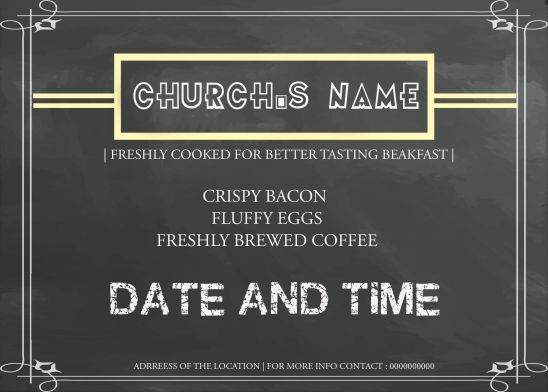 You can you this church flyer template to communicate the same to all in and around and invite them for the delicious meal. With the help of these flyers you can invite people for the Christmas celebration at your church or if are likely to conduct any workshop during the Christmas you can invite people for that by providing the name of the workshop, that is the topic going to be spoken and the phrase for it along with the time, venue, address and contact details. 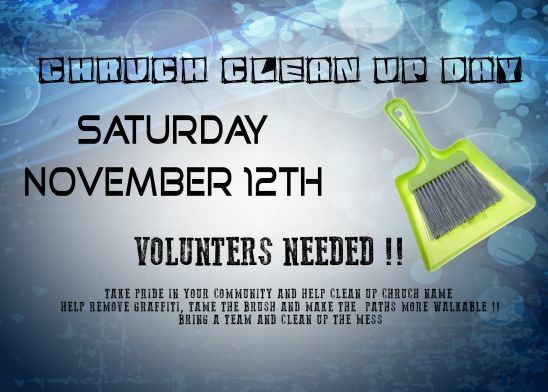 Would to prefer to advertise to look for volunteers for the purpose of cleaning the church. 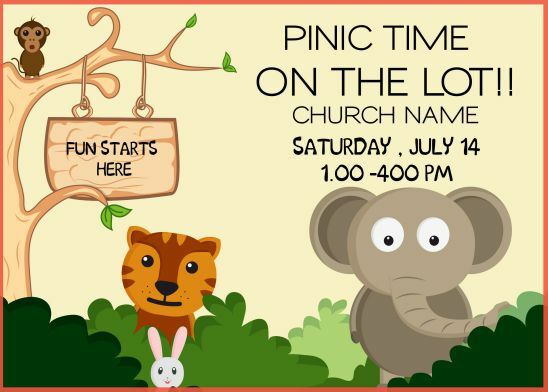 Then this template is in the ready format for you to go ahead and just update the date and time about when it is going to happen and church details. 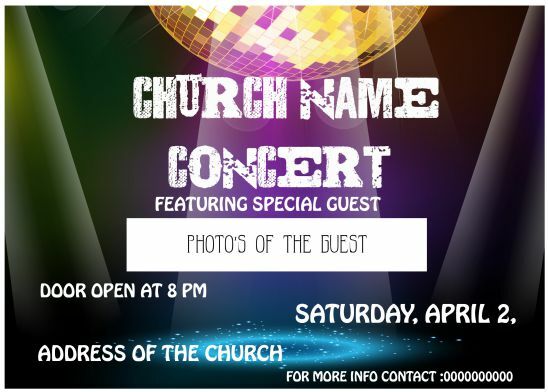 This beautiful template and be used to inform people about any concert happening at your church and grab the crowd for the event. These free printable flyer can you used to invite people for the free banquet at the church as part of the church anniversary celebration. 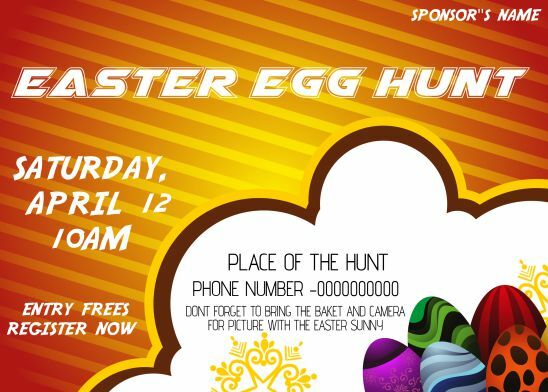 This attractive template can be used to invite and spread the news around about the Easter egg hunt that is going to happen in your church. This good looking template can be used to communicate people about the upcoming church ministry events and you can spread the faith to all. If you are looking forward to encouraging and conduct a game event for the kids then this ready-made template is at your place to just download it for free, modify with any changes required and use it. This adorable template can be used to spread the news about the upcoming event of giving away sins and inviting all for the same. Are you going to open a new church? 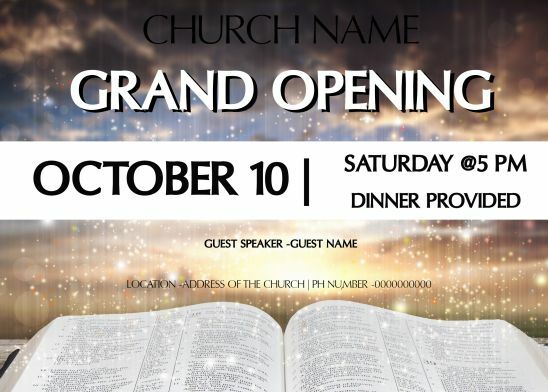 Would you like to invite all for the grand opening ceremony of the church? Then here you go, this template with be helpful in modifying the details at the earliest and circulating it to everyone. This beautiful Halloween church flyer can be downloaded and printed for inviting everyone to join the Halloween celebration happening at your church. Would you like to people let know about the history of your church? 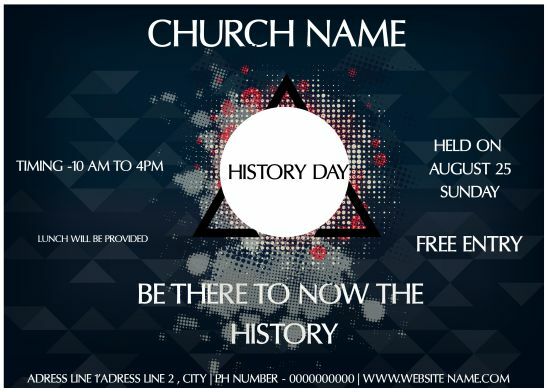 Then you can use this free printable wonderful template and invite people to know about the history and importance of your church. Are you conducting any get- together with a celebration at your church would you like to invite a family friend for the party celebration. Here is the most stylish template in the ready to use format for you to download, add the necessary details and start spreading the news about the event. 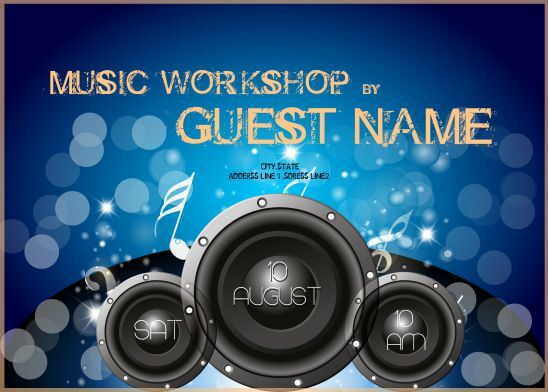 This church flyer template will be useful for you to spread the news about the musical workshop going to be held in your church and invite people for the workshop. 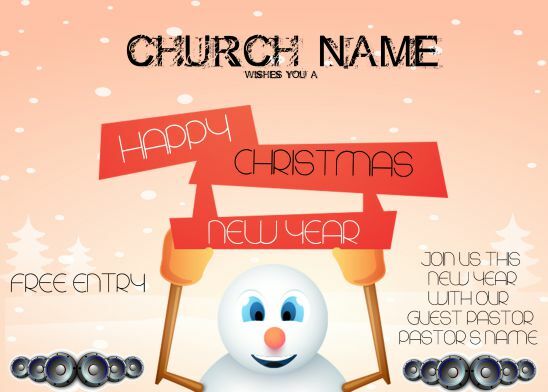 This church flyer template will help you in inviting everyone for the Christmas and New Year celebration at your church and enjoy spreading happiness to all. Revival workshop will help people refresh their thought and generate good and positive vibes in them. 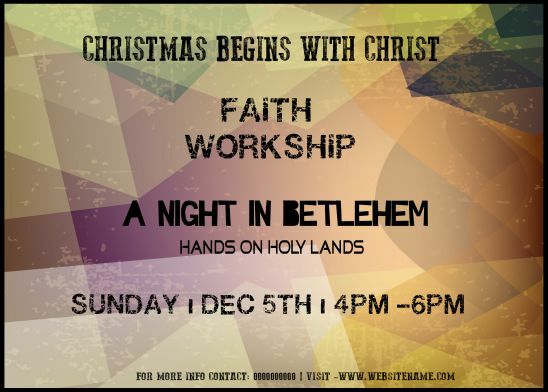 This pretty church flyer can be used to invite people for such workshops conducted at your church. 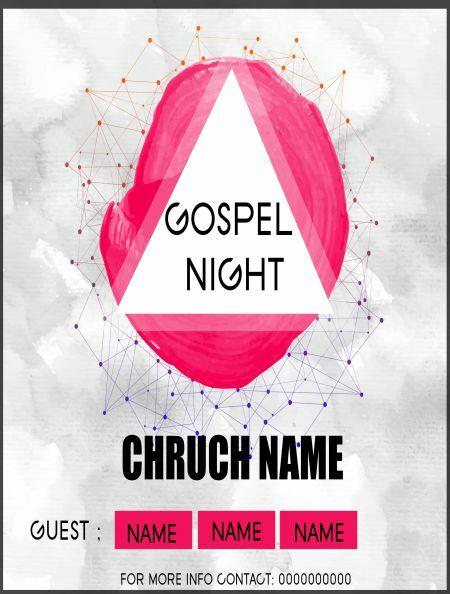 This most stylish and stunning church file template will help you in spreading the news about the gospel night happening in your church and invite people for the revelation of Christ. Have you changed the location of your church? Would you like to inform it to the member and others about the change in location? This church flyer will help you spread the news. 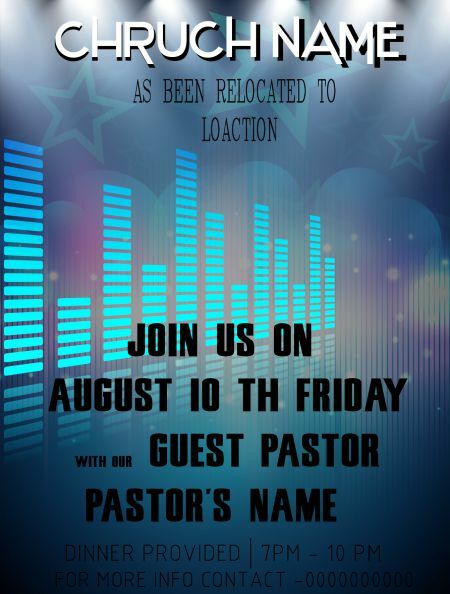 Are you looking for the most attractive and pretty church flyer template to inform people about the movie night that is going to happen in your church? Then there is the most beautiful template for it, which you can directly download for free add / modify all the details required, print them and give away to all as an invite and enjoy the event. These wonderful set of church flyer templates are presented here for your perusal and to make your work easy. These will help you in advertising and informing people about the wonderful events and happenings in the church and enjoy spreading happiness and cherish with happy memories. In this section, we shall look in details about the components that need to be included and the structure of any church flyer template. 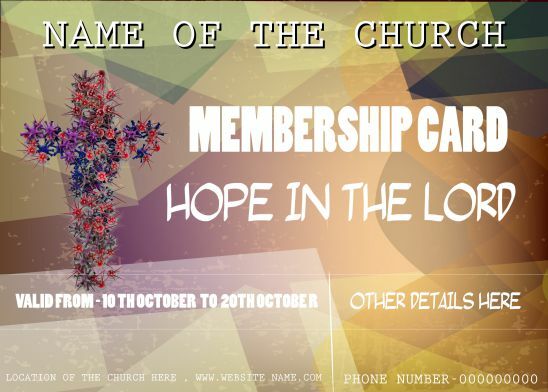 • Title – Title here is nothing but the name of the church were the particular event is going to be held/conducted. You can include the photo or logo of the church as well. • Venue – Address of the church were the event is going to be conducted. 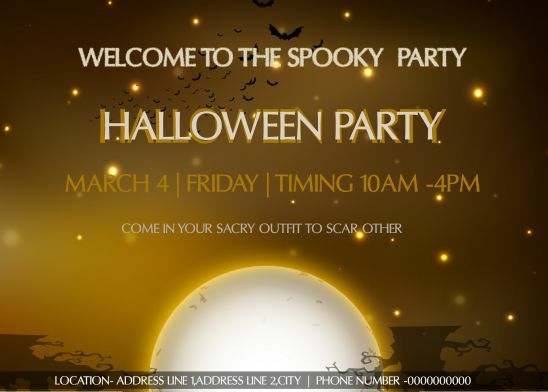 • Contact details – Contact details of the church or point of contact to inquire about the event details. 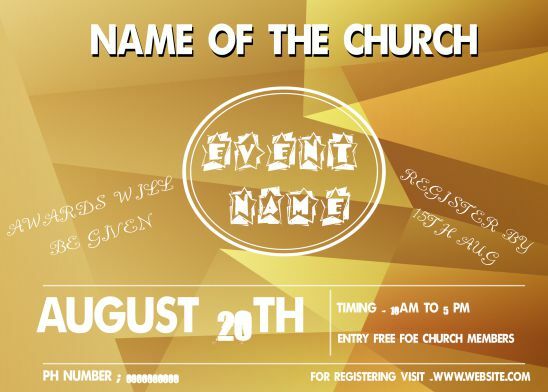 • Event Name – This is the main purpose of the church flyer. Mention the name of the event which is going to take place. • Date and Timing – specify the date and time at which the event will take place. • Guest Name / Photo – Depending upon the kind of the event specify the name of the guest, if required. • Registration details – This again is not a mandatory field. Not always registration is required. Specify the registration details only if is demanding for that particular event. • Wordings – Attractive quotes and wording from the Bible can be added as part of the church flyers which in-turn might generate some good vibes. 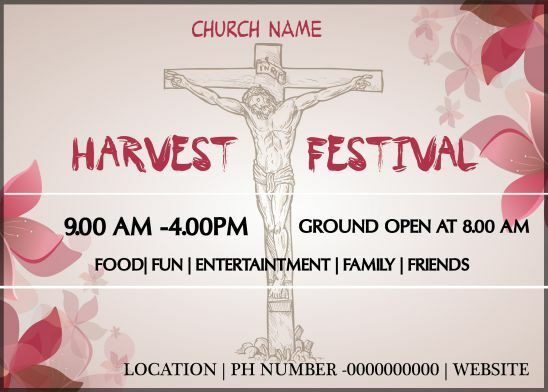 Above mentioned points along with any additional components can be added as part of a church flyer template according to your need and requirement. At the same time, you can also create your own template from this, by just downloading the template available here in our page, adding or modifying the themes /colours/background/fonts etc. And your very own template will be ready to use. Wordings are the most powerful weapon to grab people attraction. 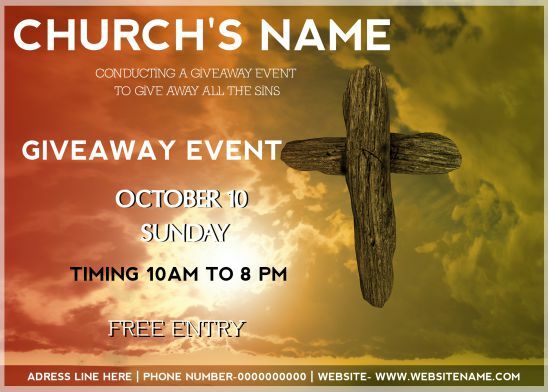 You can apply this mantra on your church flyer templates as well for attaining people’s attention and conveying the information quickly and easily. 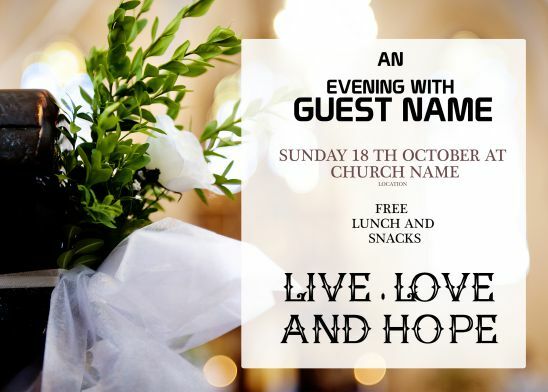 If you consider the Church flyer templates, most important wordings are the name of the event and the corresponding quotes or phrases in general or relevant to the event. You can also put some relevant Bible quotes which people can relate so easily. 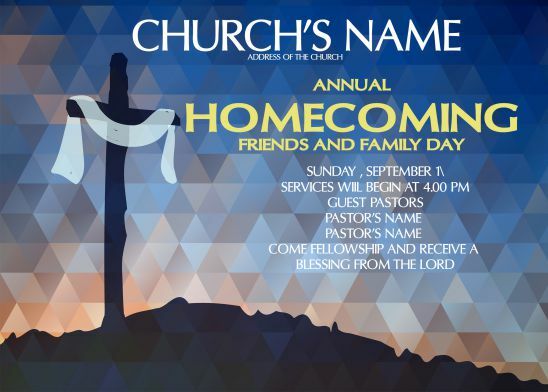 • Name of the Event – This serves the main purpose of the church flyer. You can fill this with attractive words and add-ons like a stylish font. 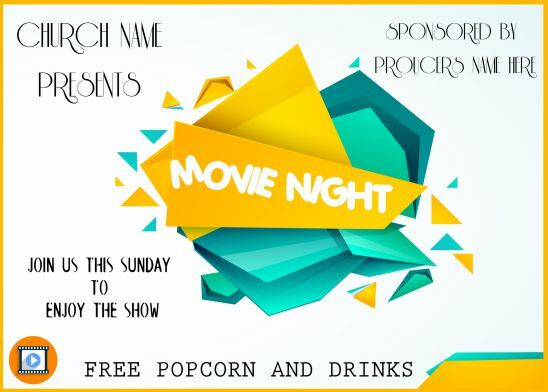 For example: If you are going to prepare a church flyer for any movie night, the general name will be “MOVIE NIGHT” but instead you can give it as “WATCH NIGHT” which will be even more attractive. • Quotes or phrases – you can quote any Bible Phrases related to the event or any famous sayings. For example, if you are going to create a church flyer for worship purpose then you can mention a famous quote by Rick Warren – “The more you pray the less you will panic. The more you worship the less you worry. You’ll feel more patient and less pressured”. Similar once can be quoted with good and apt wording for the outcome of the most unique and beautiful church flyer templates and the same can be downloaded from here and utilized instantly. 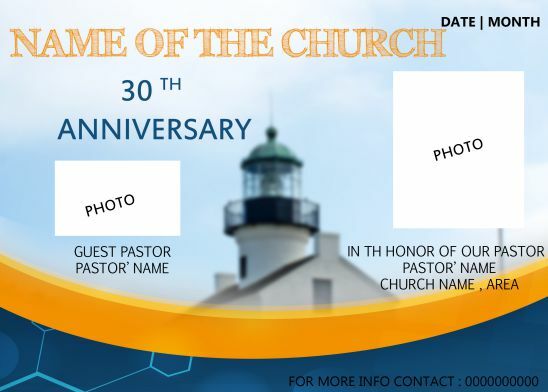 This is the general activity informer, like a common template for any kind of flyer, where you need to update the name of the event happening, Name of the church, Name of the guests, Guest photos if required, time and date of the event, the contact information and that all your church flyer is ready to use. Simple right!! 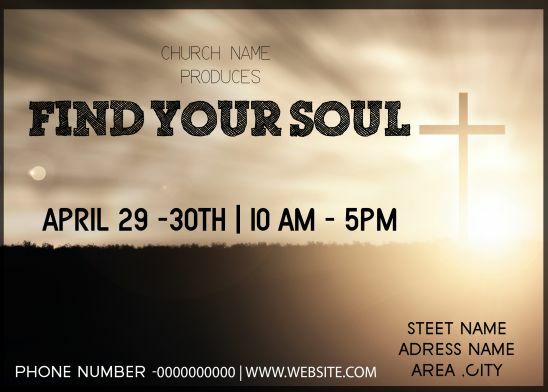 You can download your required templates from the beautify and most stylish Church flyer templates. Wondering where and how to use the church flyers? Listed below the same for your reference. • One of the best ways to advertise and inform/communicate with people about the events /Anniversary/concerts etc related to or happening in the church. • The good way to promote the church and drag people’s attention. • You can print it in the size require varying from A3 to any size as required. 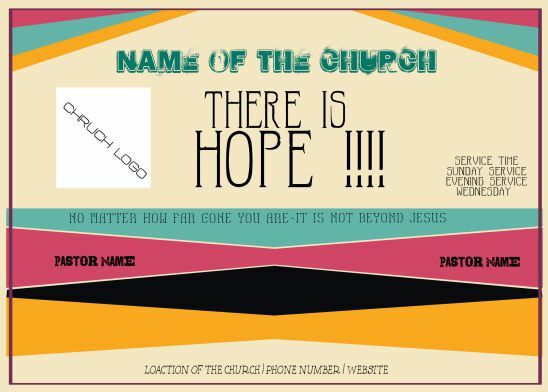 • As these are small/big papers this can be easily circulated to people while they come to church or any commonplace were more people gather.